WATCH: Mass Goes 1-2-3 In Sweep Of New England Boys 55 Dash! 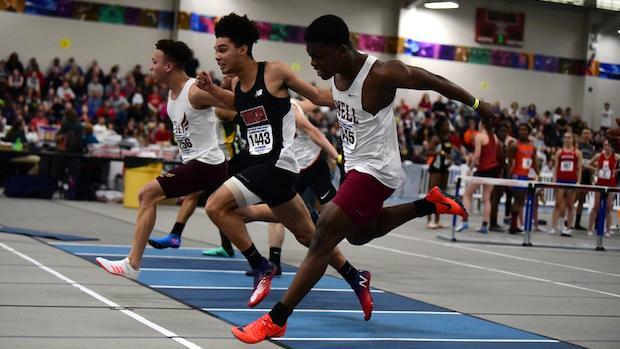 A photo finish is an understatement to describe the boys 55 meter dash finals at the 2019 New England Championships on Saturday. A microscopic finish would be more accurate deciding the job required by the timers to distinguish the 3 way race between three of Massachusetts best in Shepherd Hill junior Bryan Santos. Wobourn senior Marcus Qualls, and Lowell junior Richmond Kwaateng. Santos had been the state's fastest and best for much of the indoor season, but Qualls defeated him last week at the All-State Meet. It looked like at New Englands it would be another battle between the two, but Richmond Kwaateng decided to crash the party and late in the race looked like he might have upset them both. However, in the end it was Santos ontop by a fraction of seconds at 6.40 over Qualls also timed at 6.40 and Kwaateng in 3rd at 6.41 for a 1-2-3 sweep of the event by the state of Massachusetts. Expect this trio to fare well next week against national competition at New Balance Nationals as well.